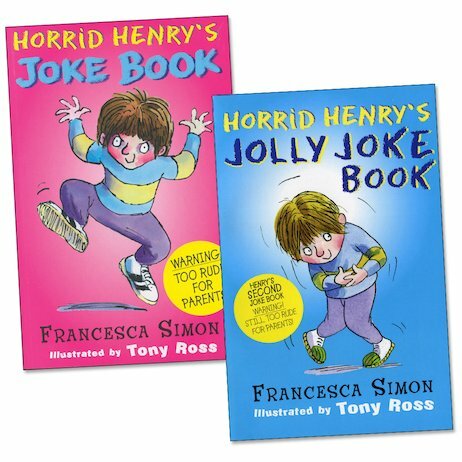 Horrid Henry loves to laugh. Not at nice things, I’m afraid. But definitely at naughty, nasty, mischievous things that would make your mum go erk! In this bumper pack of double joke trouble, Henry lets rip with all his cheekiest chuckles, from Demon Dinner Lady Laughs to Scary Screamers. Tie yourself up in knots of laughter at his gruesome gags. Groan with wicked delight at his punishing puns. Shriek with glee at his terrible tales. Just remember to hide them from your mum! This book has some very very very funny jokes and i will propubaly read this book till i know all the jokes off by heart!!!!!!! ha ha ha!!!!!!!!!!!!!!!!!!!!!!!!!!!! and i rated it loved it but if there was a higher rating than loved it horrid henrys joke book would be straight in there!!!!!!!!!!!!!!!!!!!!!!!! What goes 300mph on a washing line?